Washington Redskins head coach Jay Gruden has said that running back Matt Jones is “doing a good job of competing for a spot at running back.” Recurring fumbling issues led to Jones’ benching in week 7 of the 2016 season, and Jones remained inactive for the remaining nine weeks of the campaign. In 2015, he was given the ball 144 times and amassed 490 rushing yards. He led all Redskins running backs in touchdowns (three), missed tackles forced (21), and his elusive rating of 36.0 ranked fifth of 12 rookie running backs with at least 85 rushing attempts. 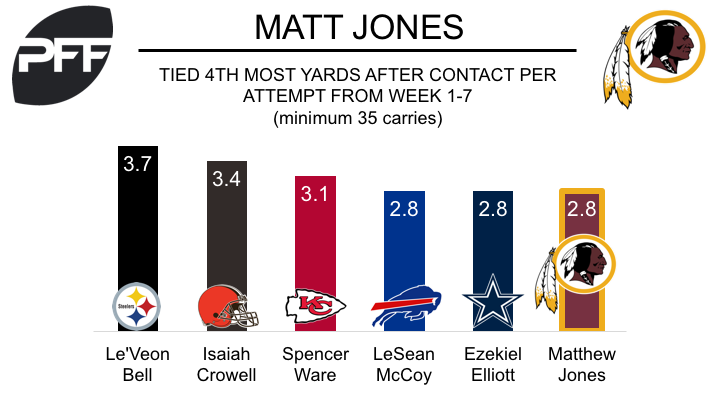 Jones handled 64.2% of the Redskins carries from weeks 1-7, and averaged 2.8 yards after contact per attempt, which ranked fourth of 25 backs with at least 35 attempts during that time. Jones will have a strong chance of earning a roster spot if he can improve his ball security. Over the last two years, Jones has averaged a fumble once every 34.7 carries, the most frequent among backs with at least 100 rush attempts.